The free GODAN e-learning course on Open Data and Research Data Management in Agriculture and Nutrition - started on 13 November 2017 - is at its third week. The course focuses on how to deal with different types of data formats and uses, and on the importance of reliability, accessibility, interoperability and transparency of data. The course is enriched by a number of Webinars designed to strengthen the course content, and to give course participants broader perspective in the relevant Open Data areas. Strategies for supporting collaborations and building relationships for Opening Data in agriculture. allowed participants to create interactive environments with questions and discussions. 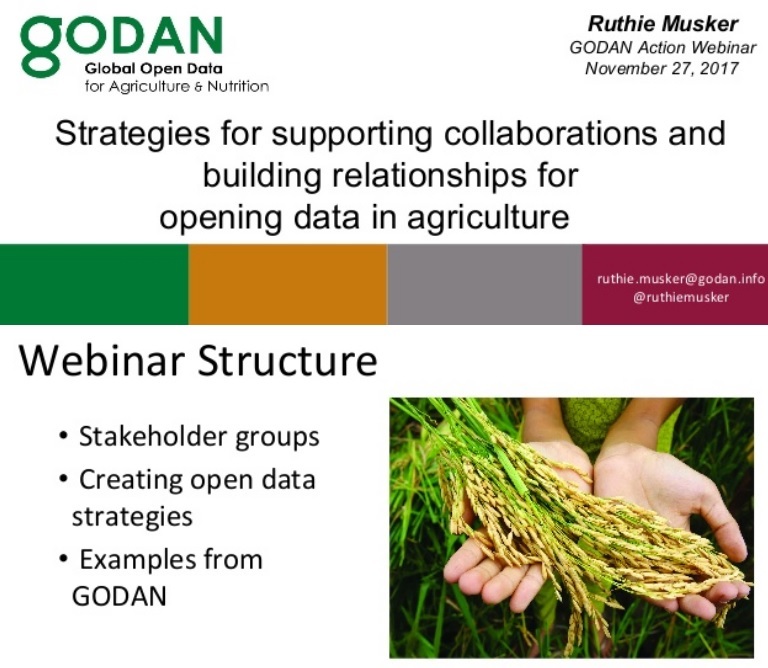 (*) About Ruthie Musker, Strategic Projects and Partnership Leads at GODAN. Ruthie holds a bachelor’s degree from University of California, Los Angeles in Ecology and Evolutionary Biology, and has performed ecology field research in California, Mexico, and Africa. She received a Master’s of Science from University College London in Environmental Conservation and received a Distinction on her Master’s thesis on information gaps in published materials of human-elephant conflict data. Before joining GODAN, she worked for the Agricultural Sustainability Institute at University of California, Davis and the Swiss Federal Institute of Technology in Zurich to assess resilience along agricultural value chains, by developing ontologies and standardized vocabularies, and analysing indicator metrics. Become a GODAN Partner today & Help support global efforts to make agricultural and nutritionally relevant data globally available and unrestricted.